Poetry has been the cradle of revolution, of a brighter day and of a new idea ever since its inception. From lullabies for infants to prayers for the old or vice versa, poetry has sought to comfort an intellect no matter what the situation might be. The relevance of poetry to a modern day society consumed by the idea of, ‘form following function’ might be a tad bit difficult to understand. However, history stands in testament to the fact that poetry has played a crucial role in disseminating ideas to those too bored of normal conversations or diatribes against what they believe in. It’s more behavioral than it is material. A Sandra Bullock movies called ‘Our Brand is Crisis’ has a dialogue by Bullock that says, “People don’t remember what you tell them, they remember how you make the feel” And when I heard it, it was like an epiphany to me. A lot of things suddenly made sense to me. A lot of situations where I failed to convince people to bend my way was all because I never sent through a good vibe. Poetry is prose wrapped in a distinct vibe. It demands to be heard because it does not allow intrusion. The rhyme that each poem comes with forces you to hear it all the way to the end. And rhyme doesn’t always have to be musical. If I were to say, “A bird in a hand” you would instantaneously either out loud or in your head say, “Is better than two in the bush”. So when poetry is used as a vessel to carry a strong idea and when the vessel becomes an idea itself, we get what is better known as, “timeless poetry”. Frost said the exact same thing, slightly more cryptically. And his exact same ideas, resounded the amphitheatre at Stanford when Jobs said, “and it has made all the difference in my life” All this to make a simple point. Poetry is timeless not just for the sake of being entertaining or satiating but for the sake of providing inspiration. For the sake of being a documentation to the what inspiration really means, to what titillates a human mind and a soul the most. However deep we dive into technology, however consumed we might be with the things around us, we will always be attracted to poetry because while most of modern day technology still stands as a vessel to the ideas people have, what matters to them the most is the idea itself. Whatever vessel it might come in. This is what I learnt from Raghavendra Madhu, the founder and the amazingly talented curator of Poetry Couture. An avid lover of poetry ever since he was a child, this Kolkata born Tanjore Maharashtrian found his love for literature in verses that can move souls. Yes, I know, the words Tanjore Maharashtrian do not make sense. Didn’t to me either. It’s basically a South-India variety of a Maharashtrian. This is when vada pav became mendu vada but before it became a donut. Racist jokes aside, Tanjore is a place near Chennai where his ancestors migrated to and formed a community. He himself didn’t know he was one till he moved to Pune and realised he wasn’t the usual kind of Maharashtrian. 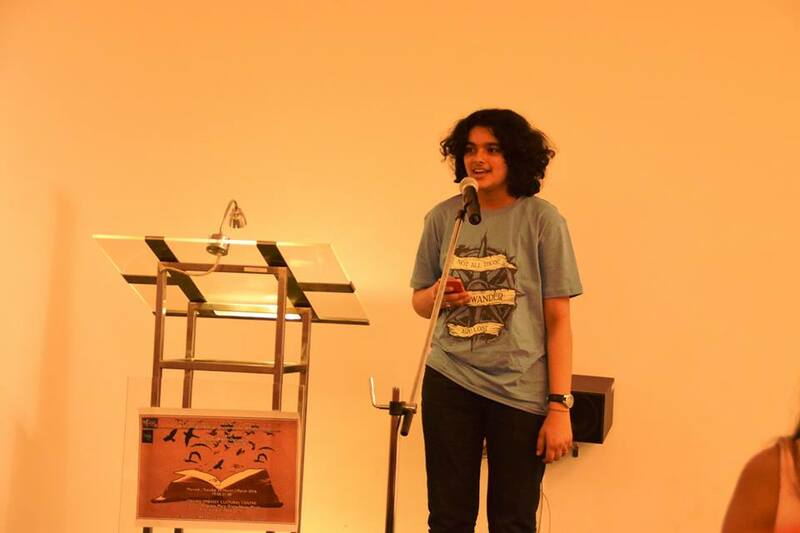 Poetry Couture is a collective that aims at gathering fresh and budding poets across major cities of India and organize recitations for them with eminent and veteran poets attending these events. I would call it the TED Talks for poets but it ends up being much more. Raghu’s story is pretty unique. His upbringing in Kolkata exposed him to a lot of poetry, both contemporary and periodic, in his early days. This is what made him realise that the population in general is “losing level in terms of poetry not just in English but in Hindi and in Urdu as well” After long lamenting the state of poetry, he decided to start Poetry Couture in 2014 in a small cafe in Vasantkunj in Delhi. Being a South Indian- Maharashtrian from Kolkata gave him roots in several different cities in India helping him quickly organize small but effective events in Kolkata, Chennai and, Mumbai. Raghu builds his team as he goes from city to city, identifying new people and using their help to conduct further events even if he isn’t around. READ These Bollywood stars originated from theatre! Raghu did his Bachelors in Hospital administration from Kolkata followed by an year and a half at Apollo hospitals. This is when he realised that he did not really want to stay with corporates since they limited the kind of things that he could do. And along came the decision of doing a Masters in Public Health that could bring him closer to doing some good for the people who need it the most. Raghu worked with several NGOs during his Masters in Pune and later took up a job with the state government in Chhattisgarh working after improving the region’s rural and urban health scenario. It proved to be a turning point when he moved to Delhi to work with the Public Health Foundation of India. That’s when the innate love for poetry transformed in the now hyperactive collective. Raghu plans to set up a festival in Kolkata that could be a reflection of the art scene of the city just the way the famous Kala Ghoda festival is a beautiful collection of the art scene in Mumbai. With this he plan to expand into other forms of art and make it an all inclusive festival at some point in the near future. There is too much happening up there, I know, poetry collective, art festival, public health consulting, let’s take a step back here and peek a little deeper. “When did you really start loving poetry? Does this come to your naturally or was there a process involved?” I ask this to escape into a more comprehensible zone of conversations. Poetry Couture is an amazing collective to be a part of. Something that surely raises the bar in terms of what modern day entertainment could also look like. Fun, joyus, demanding, nurturing and giving, all at once. I have seldom waited for something so long. I am waiting for you to write to me. I have read and reread, learnt all you sent. Your words still young, my eyes are spent.